Companies today know they must embrace digital or face being obsolete. But digital is not just about writing an app - it's about rewriting your company and changing the way you work. 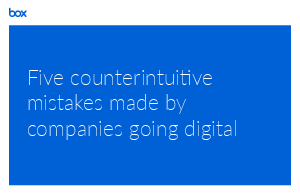 This eBook highlights five counterintuitive mistakes frequently made by organizations that seem rational when building a digital strategy, but actually can be course-altering mistakes. It also provides an alternate path to achieving the same objectives using approaches common in successful digital companies.